The vendor landscape of the global soft tissue allografts market depicts a substantially fragmented landscape due to the presence of numerous players, says TMR based on a newly published report. Most companies are likely to embrace mergers and acquisitions as a prime strategy to facilitate their geographical expansion. A notable example involves Allergen PLC, which held a leading position in this market in 2016, buying Acelity L.P. Inc., LifeCell Corporation in February 2017. This acquisition has made the company enter the field of regenerative medicine, thus enhancing its compilation of products and services. Most players are focusing on upgrading services in compliance to the latest regulations, streamlining surgeries, and making operations least-painful and invasive. 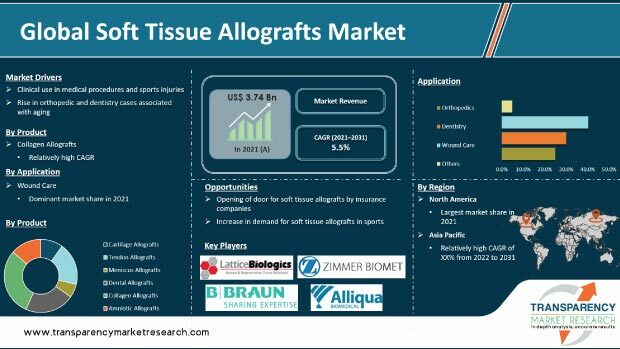 AlloSource, Arthrex, Inc., Organogenesis Inc., Globus Medical Inc, B. Braun Melsungen AG, RTI Surgical, Inc., Straumann Holding AG, and Bone Bank Allograft, are chief players operating in the soft tissue allografts market. The global soft tissue allografts market was worth US$3.6 bn in 2016, and is expected to show an increased valuation of US$6.2 bn by the end of 2025. This rise is predicted to occur at a healthy CAGR of 6.3% during the forecast ranging from 2017 to 2025. The global soft tissue allografts market is segmented based on allograft type, end user, region, and application. Under allograft type, the market comprises tendon allograft, dental allograft, collagen allograft, meniscus allograft, amniotic allograft, and cartilage allograft. Of these, collagen allografts segment gained maximum demand in 2016, owing to its frequent requirement in orthopedic surgeries, aesthetics surgery, and wound care. However, the forthcoming years are expected amniotic allograft segment to depict a good performance thanks to increasing investments made by businesses to create allografts from amniotic fluids and tissues. Geography-wise, the global soft tissue allografts market is spread across Asia Pacific, Latin America, North America, Europe, and the Middle East and Africa. High prevalence of diabetic foot ulcers, coupled with strong healthcare infrastructure for treating diabetes affiliated diseases have made North America hold a dominant position in this market in 2016. Rapid expansion of businesses to create advanced tissue allografts in North America are also responsible for this market to progress in this region. Owing to a frequent requirement of tissue allografts in surgeries and implants, an increase in such treatments in the past few years has significantly bolstered the global soft tissue allografts market. Rising number of old-aged people in many countries has also resulted in a higher number of cases dealing with orthopedic surgeries to exist, consequently boosting the demand of soft tissue allografts. Injuries caused in people participating in sports and outdoor action-based activities might warrant a high need of soft tissue allografts, thus proving beneficial for the global soft tissue allografts market’s growth. Lastly, a significant technological advancement dealing with creation of tissue allografts is also expected to instigate a positive growth in this market. However, high costs of tissue allograft treatment could pose a problem for those who cannot afford expense treatment processes. However the newer advanced techniques being developed by certain businesses are expected to be cheaper than the earlier ones, thereby countering such restraints. The forthcoming years are expected amniotic allograft segment to depict a good performance thanks to increasing investments made by businesses to create allografts from amniotic fluids and tissues. Rising number of old-aged people in many countries has also resulted in a higher number of cases dealing with orthopedic surgeries to exist, consequently boosting the demand of soft tissue allografts.